Erin Karski is an associate attorney with Nager, Romaine & Schneiberg Co., L.P.A., focuses her practice on workers’ compensation. She possesses Bachelor’s Degrees in Marketing and Political Science from La Salle University (2012) and a Juris Doctorate from Akron University School of Law (2015). 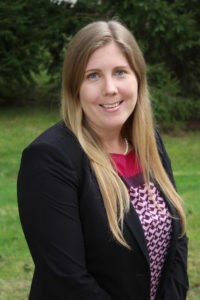 Some of her accomplishments include CALI awards for academic excellence in Tort Law (2013), extensive volunteer experience aiding limited means individuals through the University Expungement Clinic and write-on editor for the Akron Law Review (2013-2014). Before joining the NRS team, Erin practiced in the Northeast Ohio area and aided the local Akron community as a Guardian Ad Litem assisting children and families. Erin also has previous experience representing victims of personal injury in the greater Cleveland area. There, she participated in depositions, mediations, discovery, and extensive trial preparation. Originally from upstate New York, Erin Karski swam competitively while maintaining a double major at La Salle. She is an enthusiastic member of the Northeast Ohio community, and avid fitness enthusiast. Erin recently completed the Tenth Annual Akron Marathon in September 2018.